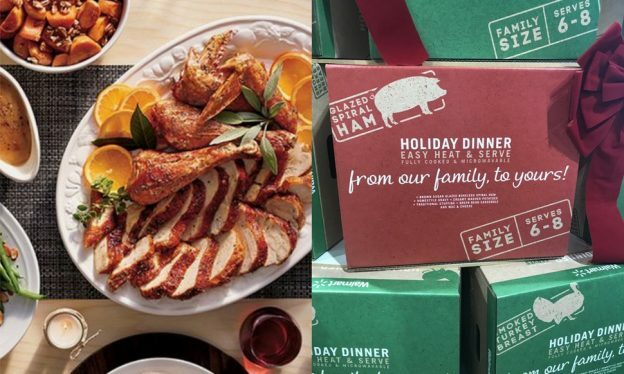 For customers hosting Thanksgiving this year who are looking for a stress-free way to pull together an epic feast without slaving away in the kitchen, Walmart has the answer with its first ever Thanksgiving Holiday Dinner – hitting shelves now! Each kit will serve 6-8 of your closest family and friends, and includes either a fully cooked glazed spiral ham or smoked turkey breast, along with the works! Think… green bean casserole, mashed potatoes and gravy, stuffing and mac and cheese. All you have to do is pop it in the oven and voila! Dinner is served. You can snag it fresh from the Walmart deli for just $47.88. The Thanksgiving kits, which are available in-store, come in two options: brown sugar glazed boneless spiral ham and smoked boneless turkey breast. Both meal kits come with the same side dishes: homestyle gravy, creamy mashed potatoes, traditional stuffing, green bean casserole, and mac and cheese.